The ultimate dual action polisher starter kit! The Porter Cable 7424XP & CCS Pad Kit is the best starter kit for new detailers or those who are new to machine polishing! This money-saving kit includes the Porter Cable 7424XP dual action polisher, an assortment of popular pads, microfiber towels, and pad care products. The pads in this kit can be used to apply fine polishes, prewax cleaners, waxes, paint sealants, and glazes. 2 Qty. Orange CCS Light Cutting Foam 6.5"- Firm, high density foam for scratch and defect removal. Use this pad with polishes and swirl removers. It�s an all around pad that will work on most light to moderate imperfections. 2 Qty. White CCS Polishing Foam 6.5"- Less dense foam formula for the application of waxes, micro-fine polishes and sealants. This pad has very light cutting power so its perfect for pre-wax cleaners. 1 Qty. Black CCS Finishing Foam 6.5"�- Composition is firm enough to withstand added pressure during final finishing to remove buffer swirls. It has no cut and will apply thin, even coats of waxes, sealants, and glazes. A total retail value of $258.56. Save $48.56! This kit is by far the perfect way to get into detailing. It comes with a variety of pads, each with a specific purpose. The product / pad combination this kit comes with allows you to get comfortable with the orbital buffer, before you decide to work your way up up to more aggressive detailing items. This kit paid for itself the first year I had it. ProsEasy to use, reliable, durable. I have been using a orbital buffer for years but was hesitant to spend the money for the Porter Cable 7424xp. After using it for the last couple weeks I wish I would have bought one years ago. It is truly the best and fastest way to a show car finish. ConsNothing really, just the price of the buffer and pads. These items worked great. If you have an RV this makes maintaining your exterior easy. ConsThat I didn't buy it sooner. Porter cable polisher much better Han expected at a reasonable price. 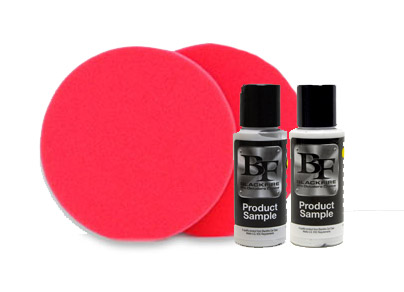 The buffing pads kit was great too. I have a 65 pick-up and a 61 Willys wagon. I thought they shined before, but now they really sparkle. After watching a gentlemen on youtube buff a car from AutoGeeks.net I was intrigued by the ease of use and the difference in made in the cars appearance. I thought this guy is a professional and it wouldn't likely be this easy. I did some internet research on the Porter Cable 7424XP buffer which returned positive results and placed my order. Once the CCS pad kit with the Porter Cable 7424 XP arrived I couldn't wait to try it out. I watched the DVD included with the kit and began to try the buffer out on my classic cars swirl marked black paint. The buffer really lived up to its reputation and was very easy to use. I found the video technique and the DVD to be helpful, the foam pads were quick to switch out and the buffer worked flawlessly removing swirl marks as advertised. My car looked geat for the car show I attended that weekend. I highly recommend a Porter Cable buffer, CCS pads and Mequier's products for a total package that won't disappoint. The only drawback I had is once people find out you have a professional quality buffer they'll either want to borrow it or ask for your assistance in making their vehicle looks as good as yours. ProsInstructional DVD was very helpful, the buffer felt as if it was professional grade quality. The CCs pads were easy to change and worked great. ConsNothing, the product worked as advertised and I feel confident in using it on any vehicle. Good price for polisher and assorted pads. Quality Porter Cable, will probably last the rest of my life. Lays down wax and polish like a hobo on a ham sandwich. ConsCould be lighter, but might compromise durability.